Here is a list of best free SWF player software for Windows. The SWF player software listed here are quite simple and easy to use. These flash players let you play different types of SWF files, like: SWF movie, and SWF games. You can view SWF files in full screen, zoom SWF files, set quality of SWF files, play local and online SWF files, loop playback, etc. Settings for storage, camera, and mic in these SWF players can also be set. You can also set SWF files playback options. SWF files can be converted to other video formats also using some of these SWF players. Out of these free SWF player software, I like Adobe Flash player the most. Adobe Flash Player is available as: browser extension to play online files, and as standalone application to play files locally stored on computer. You can also change the settings for storage, camera and mic, and playback. Apart from that you can choose which websites are to be allowed and which websites are to be disallowed from playing SWF file. Adobe Flash Player’s standalone application can be used to create projectors as EXE files, zoom, view in full screen, and set the quality of flash file display. Of course, there has been a lot of negativity around Adobe Flash Player since last couple of years, so if this is not your chosen Flash Player, then feel free to check one of the other players included in this list. Also check out the list of PowerPoint to Flash Converter Software, FLV Player For Windows, and Blu Ray Player Software. Adobe Flash Player is a popular flash player software that can be used to play SWF files. This freeware helps you view flash files available online or locally available on your PC. It is available in two different versions: Adobe Flash Player standalone application, and Adobe Flash Player browser plugins. Adobe Flash Player browser plugins can be used to play flash files in browsers, like: Google Chrome, Mozilla Firefox, etc. You can also change settings for storage, camera and mic, and playback settings to allow or disallow different settings for the playback. You can specify which websites are to be allowed or disallowed access for storage, camera and mic. Adobe Flash Player standalone application has some additional features as well that can be used to create projectors as EXE files, zoom, view in full screen, and set the quality of flash file display. Different playback controls can also be put to use. SWF Player is a simple flash player freeware that can be used to play SWF files available locally or play online flash files. It provides option to play SWF files in loop mode. It comes with options to zoom, change background color, and move the frame up, down, left, right, and align to center. One interesting feature of this software is that it lets you take a screenshot of any frame of the swf file and save as image. While playing SWF video, you can set quality of playback (High, Medium, Low). You can allow/disallow camera and mic devices to be used and set the volume or camera option. You can also view SWF files in full screen mode. Click on the button Open Movie. Then you can choose the option to add the URL of SWF file by entering the URL in the location provided. In order to open local files, click on the button Open Local Movie, and select the file that you want to play. Free SWF to Video Converter is a good software that is primarily is SWF converter. It can be used to convert SWF to MP4, AVI, WMV, MKV, FLV, MOV, MPG, HTML5 video, and GIF. This free SWF converter can also play SWF files. Different types of SWF files like SWF videos, and SWF games can be played. You can also play and download online SWF files. The information is displayed about the flash file that opens displaying flash version, frame count, frame rate, and movie size. While converting you can choose to crop the flash file and add logo to the video file. It can also be used for batch conversion of SWF files. But while converting SWF files to videos using free version, a watermark is added to the output file. 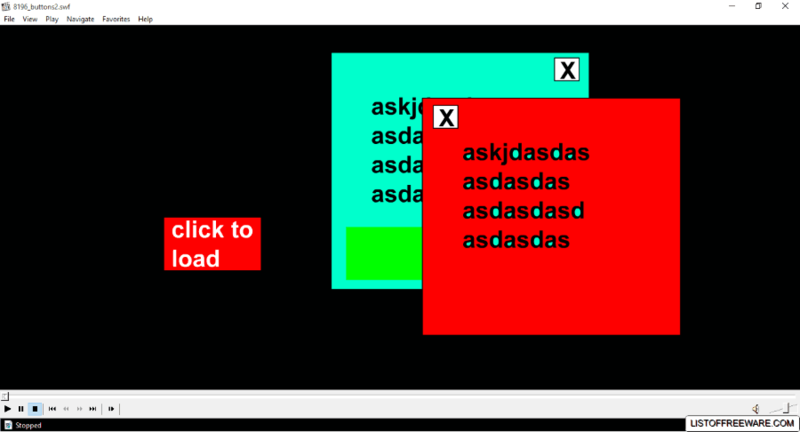 Windows .swf Flash Player is a simple portable flash player freeware. The best part of this freeware is that here you can see its source code in VB, C++, C#, and _ocx. Along with it, respective EXE files are also available. You can use any of them to play SWF files. This SWF player can be used to play online files, and files available locally on your PC. You can choose the option to rewind frames, forward frames, play and stop playing. Option can also be set to play in loop, and change display quality to either high/low. 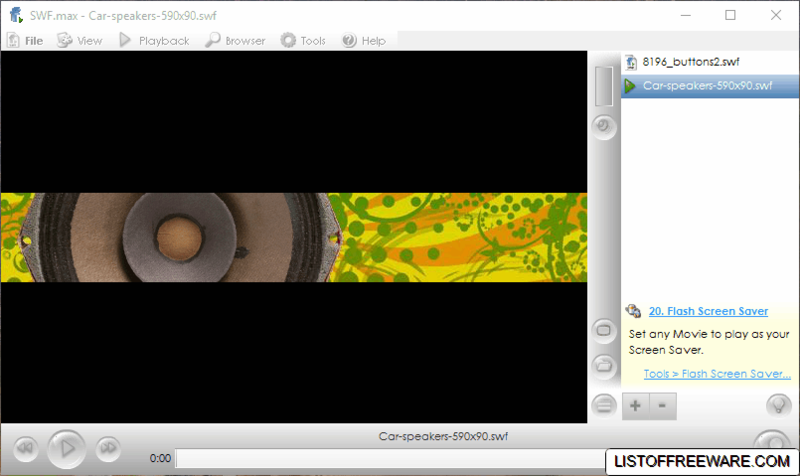 Swiff Player is a free SWF file player. You can also choose the option of Play/Pause, Stop, Rewind, and play in loop. Apart from this the SWF file can also be viewed in full screen. This flash player software also installs a Microsoft PowerPoint extension ShowRoom, if allowed to do so. This ShowRoom extension helps you insert SWF files in PowerPoint presentations which can be viewed and inserted into presentation. It can also be used to insert MP4 and FLV video files into the presentation. These SWF files can be played when you play the presentation. Free Opener is a free software that can be used to open Flash files. It can be used as SWF games player and SWF videos player. You can choose the option to zoom in or zoom out while playing flash files. You can also use it to download and watch online flash files. Videos of some other formats can also be played and downloaded using this freeware. Different themes are available that can be applied. SWF Opener is a simple freeware to play SWF files. It is a good flash player software, as here you can choose different options to set background color, view SWF cache, etc. There are other options as well that let you view SWF file in full screen, and choose different fit and border option, from the options: show all, exact fit, no border, and no scale. You can use SWF.max to play SWF files. This flash player can also be used to browse through flash files. You can also turn the volume up/down and open SWF file in full screen. It contains some other options as well that can be used to set quality, zoom, and scale movie. It can also be used to set flash as screen saver, and set flash as wallpaper. While using the option to flash desktop you can choose to mute movie sound, set transparent background, and hide desktop icons and the flash file is set as wallpaper, while in the option to set as wallpaper you can simply set the SWF file as wallpaper. The desktop is flashed after you logout, or restart the PC. In flash screensaver option you can choose movie setup option specifying quality, playback, and sound option. Specify quit reasons for screensaver which may be either mouse press or key press. Flash Movie player is a simple flash player to play SWF and FMP files. Here you can choose the option to open files available locally or play SWF or FMP files from the web. View SWF and FMP files in full screen, set zoom options, and set quality of display of SWF files. There are some other options as well to set border and scale, from the options show all, no border, exact fit, and no scale. 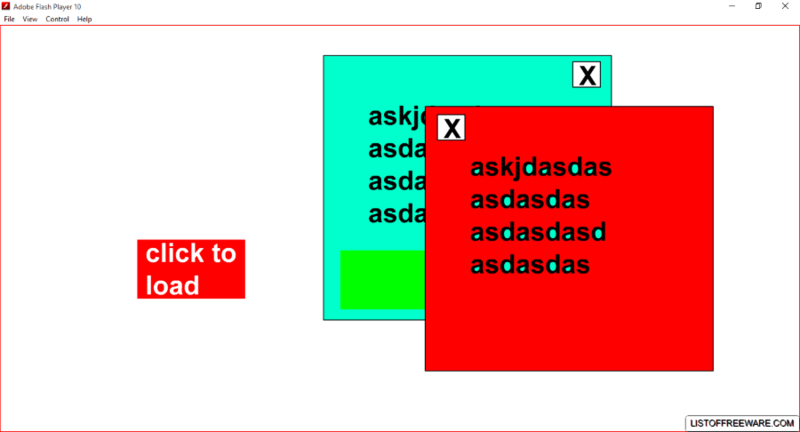 SWF file playing can be rewinded, and repeated as required. Further you can choose the option to take a snapshot, or set SWF file as screensaver. KMPlayer is a good media player software that can be used to play SWF files. You can also choose the option to view flash files in full screen. You can open SWF files located on computer, from URL, or from FTP. You can use the controls to play, pause, stop, move forward, move backward, etc. It can also be used as a audio player, and video player. This media player also lets you watch 3D videos, and 360 degree videos. SWF & FLV Player is available in free version that can be used to play SWF files and FLV files. It displays certain information about SWF file being played, like: name, number of frames, etc. There are some other options as well that let you zoom SWF file, play next file, and set volume options. The SWF file displayed can also be panned wherever desired within the frame. The quality of display can also be set, and if required the option can be set to capture snapshot. MPCStar is a good media player freeware that can also be used as free flash player. It can be used to play SWF games, SWF movies, etc. SWF files can be viewed in full screen also. You can also set the volume level, and choose to play and pause SWF file at any moment of time. You can forward and rewind SWF file using this player. Moyea Free Flash Downloader is a simple freeware to play online SWF files. You need to enter the URL of SWF file, and then the SWF files are displayed. You can then play SWF files. If required, flash files can be downloaded locally. Free SWF Player is a simple freeware that can be used as as SWF file opener software. If the folder contains a number of SWF files, it can be played one by one by just clicking the next or previous button. There are options to play previous file, next file, and change playback volume. You can also choose the option to view SWF file using this flash player in full screen. SWF files can be played using SWF File Player. While opening the SWF file you are shown the information about the SWF file like signature, version, file length, frame width, frame height, frame rate, and frame count. You can then choose the option to play SWF file. You can enjoy the pleasure of playing SWF movie files, and SWF flash files in full screen using this free SWF file player. GeoVid Flash Player is another freeware Flash player. This flash player can play FLV, and SWF files. You can choose the option to resize the screen size, and pause the playback. It provides you an aesthetic interface that can be used to play SWF games, SWF movies, etc. SPlayer is a good media player software. 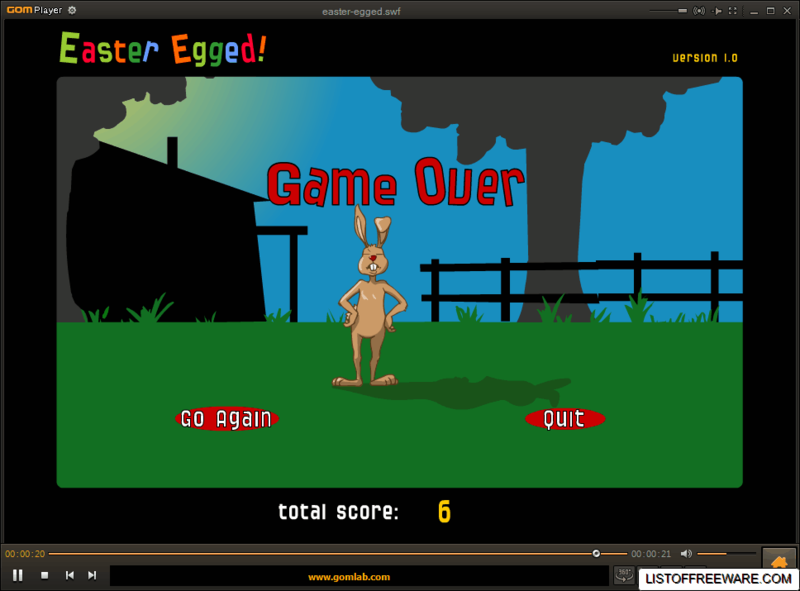 This freeware also performs the task of a flash player software, and lets you play SWF flash files. It can be used to play SWF flash media files, SWF flash games, etc. You can also play SWF files from URLs using this freeware. Media Player Classic is a popular and powerful media player software. This freeware can be used to play SWF files also. You can also choose the option to view SWF files in full screen. 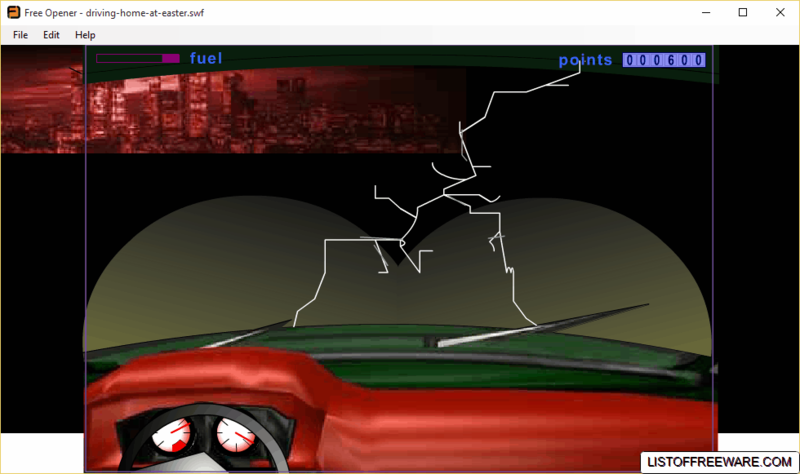 Different flash movies and flash games can be played using this free media player. Apart from Flash files, this media player can be used to play various audio and video files. 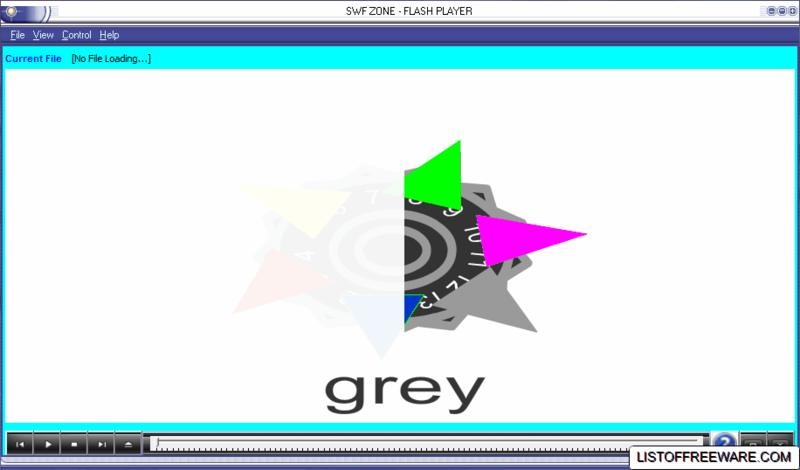 SWF ZONE – FLASH PLAYER is a freeware that can be used as as free SWF player. This SWF player has simple controls to let you view SWF files in normal mode or view SWF files in full screen. Some options to play, rewind, forward, back, and stop animation are available. GOMPlayer is a popular media player that can be used as a free flash player. 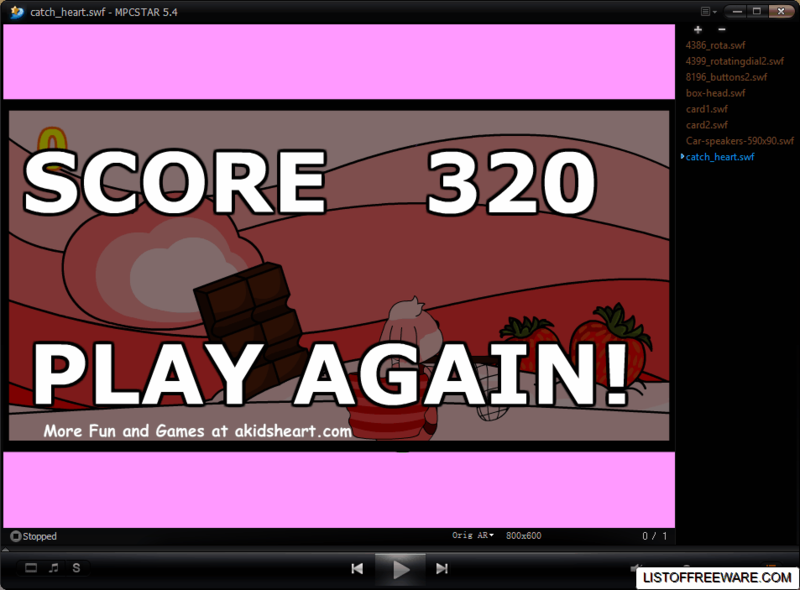 In GOMPlayer flash files can be viewed in full screen. You can also choose the option to play, pause, stop, and move forward and backward. You can use it to play flash games also. And of course, you can use it to play tons of audio, video formats, as this is a pretty versatile media player. VidBox is a software used as CD/DVD player. It can also be used as a flash player to play SWF files. In this player you can choose the option to play SWF file in full screen. Apart from that it can also be used to play audio and video files. There are some other inbuilt small games in this media player that can be played. IrfanView is a good image viewer, image converter and image editor software which can be used to play flash files. In order to play SWF files you need to install IrfanView plugins. This freeware also lets you view SWF files in full screen. Haihaisoft Universal Player is a good media player freeware that can be used to open SWF format files. You can view SWF files in full screen also. Different skins are available that can be applied. 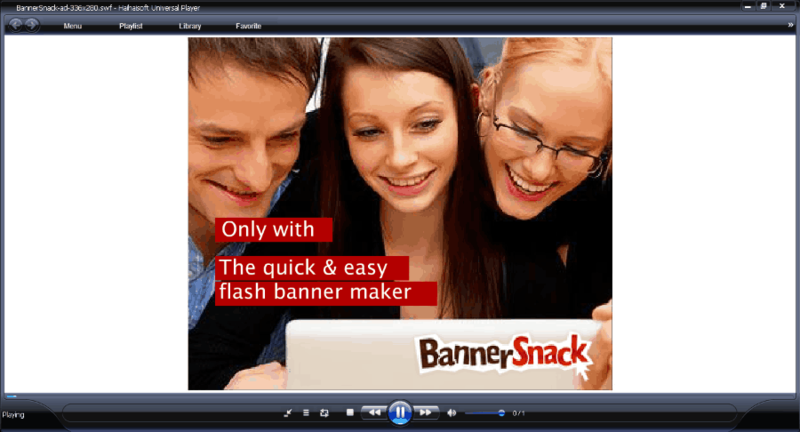 This flash player can also open different audio and video files. You can also play audio and video files from URL. MediaPlayerLite or MPlite is a simple media player that can be used to play SWF files. You can also choose the option to view SWF files in full screen, set volume, and skip to other SWF files. It can play SWF movies and SWF games.